The origin of jamu, a traditional Indonesian herbal medicine, dates back around 1,300 years ago to the Mataram Kingdom. All these years later, it’s still very much a part of everyday life on the holiday island of Bali — and possibly the cure-all your tired, hungover self has been looking for. Jamu is believed to improve general mental and physical wellbeing, as well as cure a range of ailments from run-of-the-mill hangovers to sore joints and depression. But it’s not just one jamu recipe. A Mataram medicine book from the 1700s lists around 3,000 jamu recipes, many of which are still in use today thanks to the families who have passed them down from generation to generation. While most jamu concoctions contain a variety of roots, seeds, flowers, herbs, and spices, most of today’s takes on the revered treatment come infused with turmeric. The secret is in the ingredients, although the claims of jamu’s powers are more backed by tradition than science. 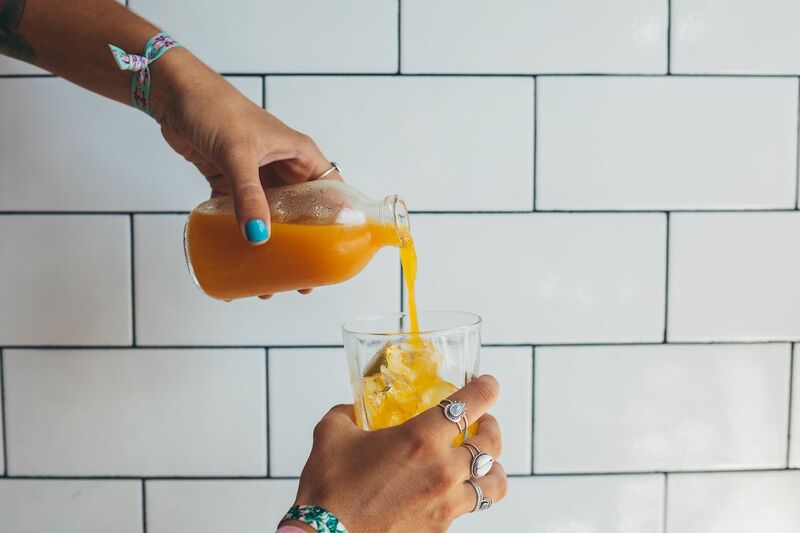 Ingredients like turmeric, ginger, and tamarind that are put into jamu are full of vitamins, and the mix is generally thought of as an antioxidant, anti-inflammatory, and liver detoxifier. It’s also been heralded as both a promoter of women’s independence and negatively viewed as a tool used to control women’s sexuality. Regardless of how you think of it, there’s likely someone in Indonesia who will back up your claim. While jamu is often prescribed by a balian, a traditional Balinese healer, it’s also commonly prepared by women who sell the potion at the island’s markets and on the streets. Traditionally called gendong, a jamu-seller used to do the rounds of her neighborhood each morning with a bamboo basket of potions strapped to her back. Today, jamu-sellers are usually seen on a bicycle or motorbike. And while the plant-based tonic is often an acquired taste due to its strong, spicy, and bitter flavor, it remains a favorite among the Balinese and health-conscious visitors to the island. In fact, a whole industry has developed around the elixir, with manufacturers producing the drink en masse for sale at pharmacies and supermarkets. The cure-all is also often retailed in the form of pills, capsules, and powder. Even so, there’s no denying that Bali’s jamu tradition has survived the onslaught of modernity. Hand-pressed potions remain available at traditional markets, through balians, and at select restaurants and cafes. Here are just a few of the island’s outlets where health enthusiasts and the curious can get their jamu fix. Located in the center of Ubud, the island’s creative enclave, Yoga Barn’s Garden Kafe and Juice Bar is a one-stop-shop for those who care about how they fuel their body. The cafe specializes in vegan and vegetarian cuisine made from organically grown produce, and it serves a number of health tonics. One of those tonics is a jamu concoction with coconut water, turmeric, and honey. The Yoga Barn also offers (you guessed it) yoga classes, as well as dance, meditation, and Ayurveda retreats. A part of Taman Bhagawan, or Bhagawan Garden, Paon Doeloe is a semi-open venue that overlooks Tanjung Benoa Beach and Mount Agung. The restaurant’s menu offers guests a “journey through the archipelago” with dishes from across Indonesia. The venue also serves one of the widest ranges of jamu on the island, with eight different options guaranteed to put a spring in your step. Some of the more unusual choices on the menu include temulawak (curcuma, ginger, tamarind, cloves, cinnamon, cumin, cardamom, and black peppercorn), sereh telang (lemongrass, butterfly pea, lime leaf, lime peel, and spices) and wedang jahe (red and white ginger, lemongrass, pandanus amaryllifolius, and palm sugar). Peloton is a plant-based cafe that “encourages earthlings to come together and tread lightly as we carry out our journey on this planet.” Aside from a variety of colorful vegan fare, the cafe serves a number of health drinks. Try the signature jamu — a chilled turmeric tonic with lime, spices, and coconut nectar — or indulge in an Ayurvedic tea, fresh juices, or a shot of superfood powders and spring water. Those who like to get around on two wheels will be pleased to know that Peloton doubles as an artisan bicycle store. Besides beer, cocktails, and soft drinks, Biku in Seminyak offers a range of jamu-inspired elixirs. 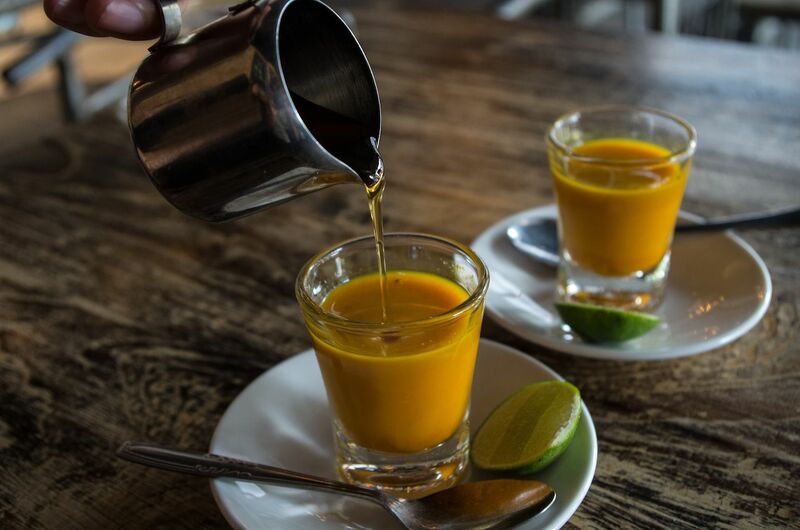 Check out the cafe’s healthy drinks section to find gems such as a turmeric, lemon, and honey drink; wheatgrass shots; and even a turmeric latte. On the food front, Biku dishes up healthy, and not-so-healthy, delights. The cafe’s menu features a range of Indonesian dishes, salads, burgers, and steaks. Housed in an atmospheric joglo (traditional wooden Javanese house), Biku also has a bookstore and a tarot reading salon. Down the street from Ubud’s Royal Palace is Nadis Herbal, a small shop that offers nature-inspired workshops and walks. Ideal for those wishing to learn more about Bali’s healing plants and herbs, as well as a holistic approach to health, Nadis Herbal gives the curious a hands-on experience of how to utilize the island’s bounty. Visitors can opt to do a jamu-making workshop or a herbal walk, during which participants also learn about Bali’s UNESCO-listed subak irrigation system. Nadis Herbal doubles as a health store that stocks natural products such as face creams, shampoos, massage oils, and lip balms.